The HGTV show Holmes on Homes aired a two hour special episode called “Lien on Me,” in which the host and his crew do remedial work on a house after the contractor has abandoned all work and filed a lien lawsuit against the homeowners. Apparently, the bank had canceled all further contractor draws on the construction loan, due to the lack of sufficient progress on the construction. 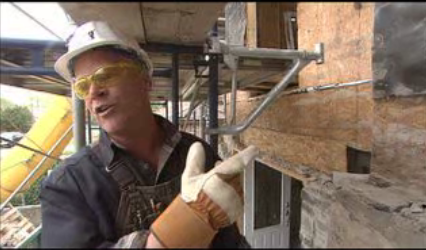 Like any Holmes on Homes episode, host Mike Holmes did a thorough inspection of the work performed and found the work to be incomplete, unprofessional, and, in some instances, dangerously incompetent. During the course of the filming, over 100 subcontractors were brought in, and the entire remediation took 30 months to complete. All that time, the lien litigation continued. To say that “most homeowners aren’t so lucky” is a huge understatement. In these situations, an owner may not have the financial resources to bring in a second contractor to complete or repair the existing work. Then, in the rush to correct the deficiencies, the owners don’t keep sufficient evidence and records of the work in dispute to prove the problems. Holmes had a TV crew and a team of experts taking detailed notes (and HD video of all the problems). I pity the contractor who has its work subjected to the glare of the video cameras and a TV host who has made his living identifying shoddy work. This entry was posted in Lien Litigation. Bookmark the permalink. he should come to the Surprise Arizona area. Just about every home here has problems. Lack of Insulation, to much sand in the stucco mix. Cracked foundations. Yes, and they charged 250,000 for homes that should have sold for the 100,000.